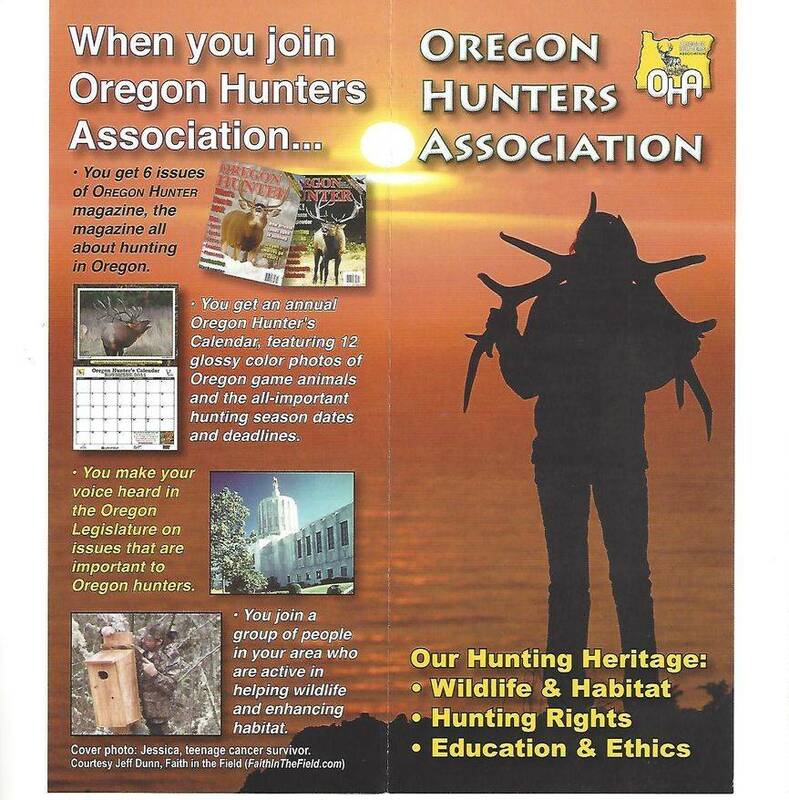 Sign up for Legislative Alerts at www.oregonhunters.org You will be sent important information on legislative actions that may affect you. Blacktail Classic Banquet update. First of all I want to thank everyone who volunteered their time and energy in making another banquet a success. Then I want to extend my thanks to those businesses and individuals who made donations. Without all of the above the banquet would not have been. I encourage all of you to carry on with what you have done in the coming year. Without volunteers and donations this chapter would not be able to conduct the business we do. If you think that you can complain about what's going on in the legislature and not do anything about it you had better think again. The animal rights people are flooding facebook with posts to contact their legislator, that means you had better be making contact making your point against the bills coming up for consideration. Not only animal rights, but your gun rights are up for grabs as well. If you do nothing you will lose! Everyone of us needs to be making contact with our legislators. For updates on what's happening and sometimes what's happening NOW, please sign up for updates from the state office - see legislative update above. OHA has a legislative lobiest working the capitol and watching for bills that affect our rights. Update: 4 10 19 The Bill passed out of Senate Judiciary last Thursday. The bill now goes to the floor of the Senate for a vote. OHA is opposed to this bill. Our general 2019 membership meetings will again feature our 50/50 raffle, the winner wins 1/2 the total collected. We also try to give a firearm away at our meetings. We're changing the rules again. In order to reward those who do attend the meetings, and they are a current member, one ticket will be drawn. The person drawn will roll a die and depending on the prize in the numbered envelope he or she may win a firearm. If you aren't a member we will be glad to sign you up at the meeting. We have a new Fred Meyer Rewards Program ID. See News and Downloads page for signing up. I urge all Freddy shoppers to sign up for this as the more supporters that sign up the more is awarded to the chapter. 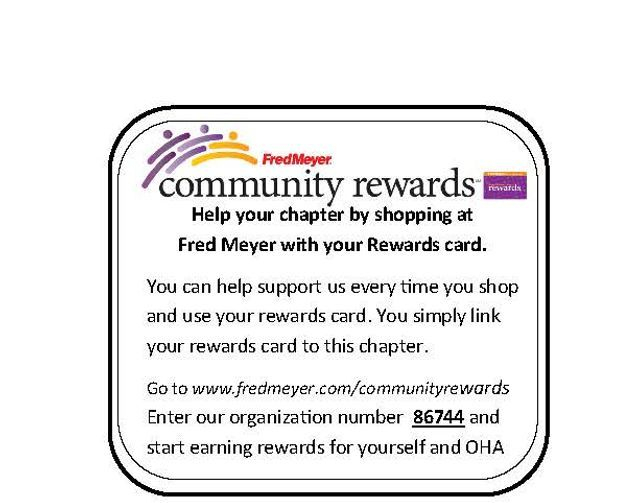 Simply sign in or create your Fred Meyer Rewards account and choose Capitol Chapter PU284. It's easy and it helps the chapter. Our thanks to those who have done so. Here we are looking into 2018. Please keep in mind that Fred Meyer and AmazonSmile will share with us a part of what you spend shopping. Also, for that hard to find gift, consider tickets to our Blacktail Classic Banquet. Forms can be seen by clicking on the "More" page. Please don't forget about AmazonSmile when you are shopping online. Amazon helps us with a percentage of all orders placed as long as you log into AmazonSmile before you place your order.